...and this is the Barn of Bannocks earlier today, which by the way is absolutely gorgeous. A touch chilly, and getting windier (not so good as I have to get the boat south tonight) but bright in that awesome way you only get in Shetland during spring. I went for a walk along the Eshaness cliffs earlier, and it was truly wonderful. 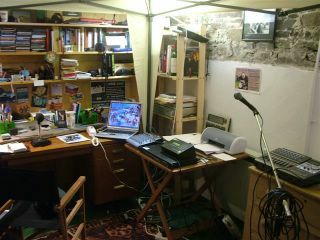 This is the interior of the Barn of Bannocks, in the garden of my house in Shetland, from where the Tom Morton Show (www.bbc.co.uk/radioscotland) is broadcast nationally, internationally and cybernautically. 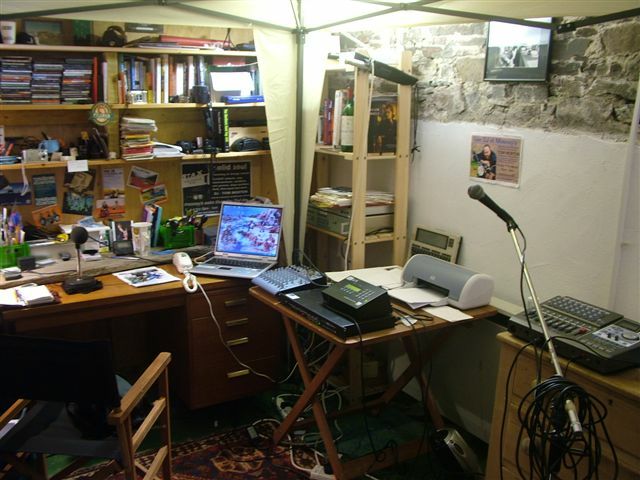 I've just acquired some digital gear which came from a redundant independent TV studio, and the sound quality is now (I think) indistinguishable from 'proper' BBC studios. 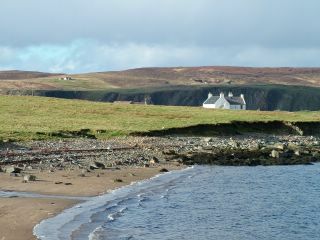 A fine day on the Hillswick Ness, looking north over to Eshaness, with our house looming whitely. The winter darkness is now officially receding. Roll on the 'simmer dim'! Perhaps telling my wife that possessing a new guitar was like "having a new woman in your life" wasn't particularly wise. She took it well, though. And the arrival of my new Moon 0003 ( http://www.moonguitars.co.uk/ )has caused little domestic trauma. But then, I did pay for it by selling (count them) three other guitars on eBay. One really old and battered Suzuki (bought at the Shetland Country Music Club's closing down auction), a Simon and Patrick 12-string, purchased on a mad whim after hearing Roger McGuinn do a live session on Radio Scotland's Janice Forsyth Show, and what was for many years my pride and joy: A rare black Martin J40 with full built-in electrics. The Suzuki and the S&P were never serious elements in my strumming-and-picking life. The Martin, on the other hand, I bought new nearly 20 years ago for what seemed then (and still does) a colossal mount of money. It has been played all over the country, in studios, bars, concert halls and living rooms. It has been dropped, scratched, battered and, alas, seriously damaged by another guitar, a Martin Shenandoah (Martin's brief flirtation with buying pre-cut parts from Japan and assembling them in the USA) , falling headstock-first into the belly. When that happened, I was so upset I put the instrument away in its case for a month. I couldn't bear to look at it. In the end, Jimmy Moon (see above) repaired it, immaculately, but I think it's fair to say I never felt the same about the thing again. And when the refinished front "finish checked" - what they call that crazy paving effect when the wood expands faster than the brittle varnish can handle) it was if the guitar itself was rebelling. James Taylor talks about "finding" songs in certain guitars; there is a magic about the process of songwriting, of the relationship you have with a guitar. And sometimes that magic just disappears. The Martin was never really a domestic guitar. It was built to project to an audience, not to the player, and so its metier was not the back-room twiddling that has largely been its fate these past 10 years. At least, that's what I told myself when I flogged it, second time around on eBay. First time, some scamster attempted to carry out that old Western-Union repayments fraud with it, but was soon seen off. Anyway, I had my eye on the Moon, which had been hanging in Lerwick's High Level Music the best part of a year. It was apparently made by Innes Thomson from Fair Isle, who was and is working with Jimmy Moon, and it would probably have sold long ago if someone hadn't given its front a whack and left a wee bit of scarring on the lovely finish. Still, as best I could tell, I liked its lively, ringing tone (typical, in my experience, of this kind of hand-made guitar) and once the other guitars were sold, I made an offer for it which was duly accepted. Complete with Hiscox Liteflite case, I think it was a bargain. And I love it. I absolutely love it. Once I had it at home, I spent some time just looking at it. And then hours playing it, fingerpicking, strumming, up and down the neck doing all those nonsensical things you don't dare in a music shop. The truth is, I'd lost my love for not just the guitars in my life, but playing them. Now, with my fingers aching, I'm keen to play all the time. Not just the Moon, either, but the old Shenandoah that visited such destruction on the J40 (the Shenandoah was a present from my wife; I'd never sell it) and the little Romanian travel guitar I cart about to hotels and apartments when I'm away. New strings on them all, and there's magic in them too. The oven on our gas cooker stopped functioning recently, necessitating the return to service of the trusty, somewhat rusty peat-fired Rayburn, once the sole means of heating and cooking in the manse, now a fallback option for those times when more modern technologies fail. A recent absence of central heating oil (during which I seriously considered using diesel, cooking oil, extra virgin olive oil or a mixture of all of these with turpentine) led to the firing up of the old range, which I must say is one of the easiest-lighting solid fuel stoves I have ever worked with. Wise men and wiser women inform me that the length of the chimney and the shape of the (right hand) flue on our Rayburn contribute to its almost supernatural ability to light first time, every time, as long as The Sunday Times (non-colour bits) is used to get the kindling going. And I suppose the fact that we stored away all the old lath from the lath-and-plaster walls we had to replace helps: you can never have too many sticks, in my opinion, as John Knox reputedly said to his final torturers. I have, though, struggled with a variety of dodgy stoves in cottages and caravans, houses and huts throughout Shetland and points sooth. The unexpectedly blocked chimney, the house reeking with, well reek; the way some fires can produce what seems to be concentrated essence of peat oil, in commercial quantities. The freezing living room which simply stays cold, despite repeated attempts at lighting a recalcitrant fire. The increasingly deranged attempts to create a draft on a windless day, and the use of dangerously flammable substances to get something started: salmon feed bags (oh, the damage to the ozone layer!) the aforementioned diesel. Err…petrol, lighter fluid, air freshener (straight from the aerosol – don’t try this at home kids) and aftershave (Yves St Laurent, since you ask). The chestnuts we roasted didn’t taste quite right. But they had a certain je ne sais quoi. Our Rayburn (its redundant back boiler now filled with sand) is not a beauty. It could never feature as an Aga-substitute in one of those interior design features. For a start, it’s that hideous brown-fading-to-grey colour from the 1960s. The enamel is chipped in numerous places, there’s rust aplenty. 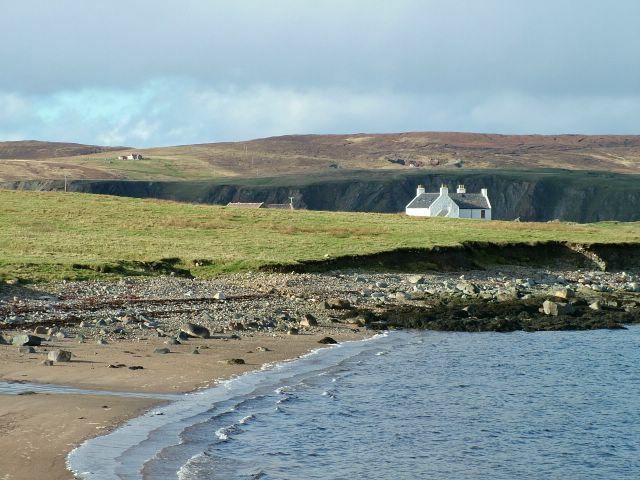 When the manse was seriously flooded, way back in the years BA (Before Armouring) it had a firebox full of seawater, and allegedly two workmen perched on the hob to escape the attacking giant sea urchins swept in by the implacable tide. But it still works. And how. The problem we had the other week was an inability to cook pizzas. In fact, everything edible in the fridge needed an oven. So it was time to sweep the various ornaments off the Rayburn and get to work with the Sunday Times, some lath and the best blue peats we could find. It was moderately windy. And once the oven began to heat up, it wouldn’t stop. Way past 300 degrees C it went. Pizzas (or peatsas, as the bairns called them) cooked in seconds. A chicken stew was carbonised in 15 minutes. We were offering cheap saunas to passing Finns. And eventually, anxious gazes at the smoke belching out of the chimney indicated that bad things were happening in the lum. Even a large shovelful of wet sand in the firebox didn’t put the Rayburn out. It just stopped the chimney turning into Northmavine’s Mount Etna. As things have returned to normal, as ovens have started working again, as we have grown confident in our supplies of kerosene, the Rayburn has returned to coolness and operates as a kind of cast iron sideboard once more. But when it’s in full fiery flow, it regains its rightful role, becomes the absolute core of the house, the centre, the thing around which we huddle and have our being. 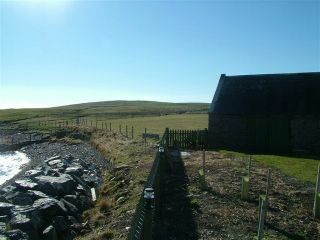 Last week I was raking around in the ruins of Seaview, one of the old Heylor houses, and found a bit of its old stove. The piece of iron door still had the range’s name (and it’s significant that all stoves have names – Royales, Regents and the like) clearly embossed: Enchantress. And yes, there’s a magic about a good solid-fuel stove. Ours has a name too, but it’s not stamped anywhere, or visible to anyone but me. It’s home.